Blueprint Jonesboro is a community planning process that will create a vision for the future of downtown Jonesboro—a vision that will grow our economy, leverage Lee Street Park, encourage appropriate development, make walking and biking easier, and revitalize the Main Street corridor! We need your input to make sure that the plan is successful and reflects the interests of local residents and stakeholders. Our Kickoff Meeting will allow you to learn how the Blueprint Jonesboro process will unfold and participate in an interactive exercise to share your opinion about the future of downtown Jonesboro. Light refreshments will be provided. Join us! Wednesday, October 5, 2016 at 6:00 p.m. 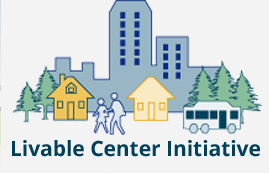 Since its inception in 1999, LCI has assisted 112 communities with more than $194 million in planning and implementation grants to devise strategies that reduce traffic congestion and improve air quality by better connecting homes, shops and offices. LCI communities cover less than four percent of the region’s land area, but contain seven percent of its residential development, 29 percent of its commercial development and 69 percent of its office development. The City of Jonesboro, in their 2003 submittal of proposed and ongoing plans for the City, had hired JJ & G and Goulding and Ackerman Company to assist with the project. They had detailed plans as to what was projected for the future regarding Transportation Improvements, Public Involvement, Marketing and Tourism. The original market analysis was conducted; historic resources and transportation were identified in the study area, including the housing and employment data for the area. At the time the focus area was the Jonesboro’s Historic Downtown, which is where the focus lies today. In 2016, the City of Jonesboro received an $80,000 grant from the Atlanta Regional Commission’s Livable Center Initiative For Community Planning Studies & Transportation Projects.The City of Jonesboro was awarded $80,000 to complete a major plan update that will account for the new MARTA bus service in the area and begin the process of planning for a future rail station, along with the expected economic growth. Blueprint Jonesboro builds on the valuable efforts of previous plans, including the 2003 Livable Centers Initiative Plan and the 2015 Jonesboro Comprehensive Plan. Each chapter of the Blueprint Jonesboro draft plan is shown below and is based on the detailed input and work of Jonesboro’s citizens. This chapter details existing historic resources, zoning, market conditions, and other factors that shape this plan and will shape Jonesboro’s future. Community involvement was a big part of the Blueprint Jonesboro process. Learn more about the engagement process here. This is the key part of the plan, which puts forth a vision for the future of downtown, including new businesses, housing, sidewalks, and more! How will the plan come to fruition? Who will pay for implementation and when will each item happen? This chapter has all the details on these questions and more. On Monday at our Worksession beginning at 6:30 p.m., we will present the final plan. To view the plan now, please visit the following link.